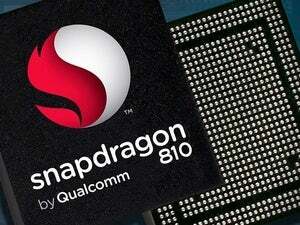 Every flagship smartphone you buy contains a processor designed by ARM. On Tuesday, ARM described what those flagship phones will look like in 2016—and they’ll all be powered by its new chip, the Cortex-A72 processor. ARM’s announcements set the table for a new generation of flagship phones. Not only did ARM announce the Cortex-A72 processor, but a new, integrated Mali-T880 GPU, a new CCI-500 processor interconnect and even optimizations for a new TSMC 16-nm FinFET manufacturing process. ARM occupies a unique niche in the chip industry. As a chip designer, the company doesn’t actually make any products, but its designs are licensed to companies including Qualcomm, Samsung and others. Those companies turn ARM’s designs into actual chips that power next-generation smartphones. 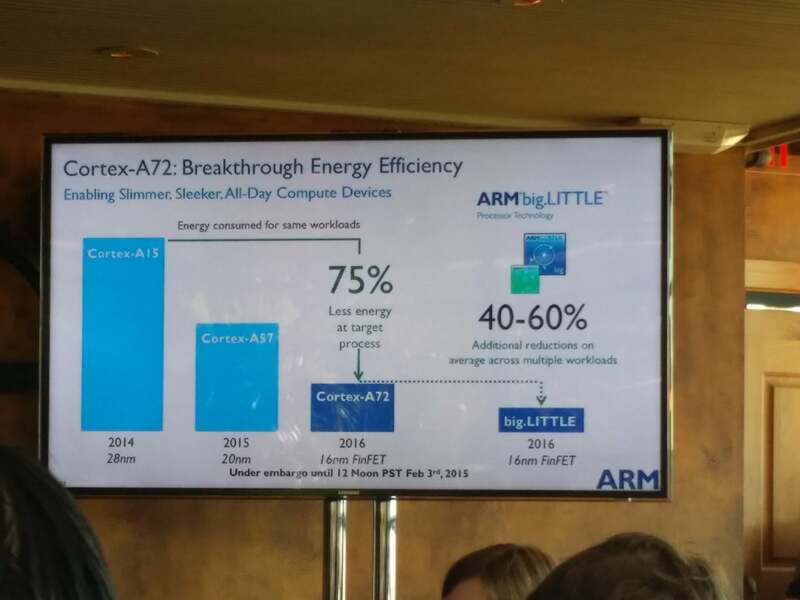 To allow time for its ten unnamed licensees to actually develop product, ARM’s new Cortex A-72 won’t ship until early 2016, according to ARM CPU group vice president of marketing Nandan Nayampally. But the chips should run at 2.5-GHz speeds, the company said. ARM's own performance estimates of the Cortex-A72. 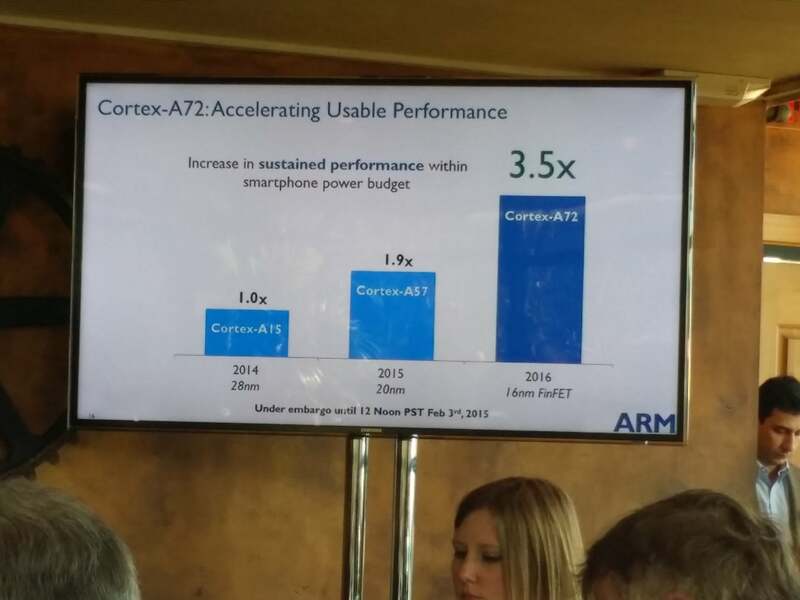 In general, ARM said its chips have increased in performance more than 50 times in five years, with the Cortex-A72 simply continuing the trend. ARM’s selling points for the A72 chip will be 4K technology, mobile gaming, and connecting the Internet of Things, the company said. ARM’s Ian Drew, the company’s chief marketing officer, said the chip will enable capturing 4K video at 120 frames per second, allowing “slow-mo” image capture that can only be done in 1080p on today’s smartphones. ARM predicts a steady drop in power, based on process and design improvements. The case for 4K: "All users hate pixels"
There will be some users with better eyesight that can discern pixels even at higher resolutions, Bruce added; the new Cortex chips will also be shipped into tablets, where displays are even bigger. In general, “there is an insatiable demand for higher resolutions and higher frame rates,” he said. ARM's new Mali core promises console-like gaming, the company said. 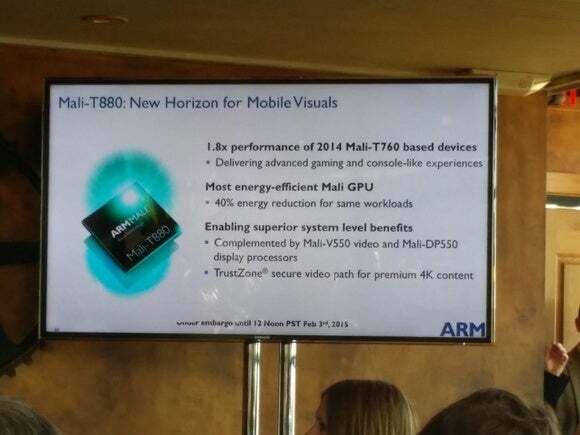 Mobile gaming will also improve dramatically, ARM said, as the new T-880 integrated GPU will offer 1.8 times the performance of the Mali T-880 GPU that’s powering today’s smartphones. And to connect the Internet of Things, the chip will need to be able to spare the power to periodically communicate with sensors, smartwatches, and other devices; the A72 will consume 75 percent less power than the Cortex-A15, Drew said. Jem Davies, an ARM fellow and the vice president of technology, told PCWorld that ARM's close ties with its customers and foundry customers mean that the performance estimates ARM delivered Tuesday will be pretty close to what you'll see in the final product. Some companies will hustle products to market, while others hold them back to tweak them until the performance is just right. Either approach is just fine, he said, and ARM's neutrality benefits the industry as a whole. For example, Davies said that he personally believed phablets would fail badly. Instead, the smartphone industry sold millions. "History proved that the market doesn't care what I think," he said, as proof that ARM shouldn't decide what products to design for. "So the lesson to be learned here is that we shouldn't dictate what our partners do with our technology." The new Cortex is an ARM v8-A, 64-bit chip, meaning that it will see a performance boost if paired with Google’s new 64-bit Lollipop operating system—and not, if it’s forced to run a 32-bit OS. Today, however, Lollipop is relatively unused. According to Davies, that's not a problem; the Cortex-A72 is a very good 32-bit processor as well. While the main Cortex application processor and the Mali GPU will be the two main selling points for Cortex-A72, ARM also announced a CCI-500 interconnect, a wider, more efficient pipe feeding the chip with data; and optimizations for TSMC's 16-nm FinFET+ 3D transistor technology. FinFET technology essentially arranges transistors in a 3D array, with Samsung, Globalfoundries, and TSMC chasing Intel. According to Nathan Brookwood, an analyst with Insight64, the shift to FinFET technology itself should help boost the performance per watt each chip consumes. But Intel ended up delaying the release of its first FinFET-based 14-nm chips because they migrated the interconnect and the transistor to the 14-nm technology. 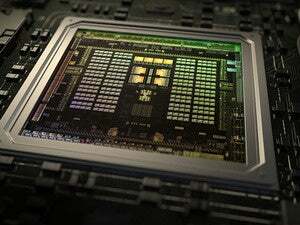 Those chips, also known as "Broadwell" or the fifth-generation Core chips, were almost a year late as a consequence. Intel's rivals learned from its mistake, Brookwood said. "Because TSMC and Globalfoundries came late to the 3D transistor party, they decided to change the transistor architecture without changing the interconnect architecture... and that has an interesting side effect. Once they get the 3D transistor working, the wiring's the same as it was before. That means that people with 20-nm designs don't have to change the wiring," meaning it's simpler and faster to port over existing designs, he said. ARM brought a number of industry partners on stage to help talk about the need for the additional performance the Cortex-A72 will bring. Anuj Gosalia, director of development for mobile and PC software for Facebook’s Oculus technology, said that Oculus could use the additional horsepower now. The Oculus technology, when paired with a Samsung phone to create the Samsung Gear VR, creates a 110-degree field of view that simulates the Oculus virtual-reality environment. But even with a Galaxy phone attached, “you can still see pixels,” he said. Updated at 3:27 PM with additional details and comments from analysts.